As someone who wouldn’t know how to exist without the animals in my life, I’m quite particular to games that have a central focus on the player’s connection with an animal companion. There’s just something special about the bond between a human and our furry—or in this case, feathered—friends. 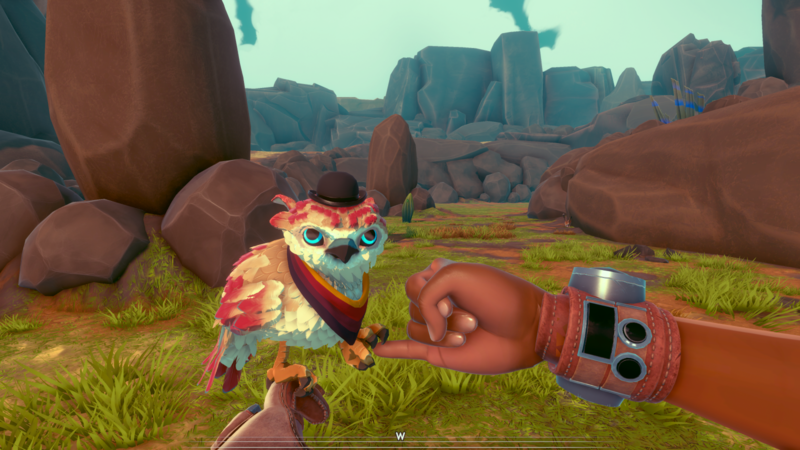 When a game like Falcon Age comes along, I put the interactions with the animal under a microscope to see if the developers managed to capture what it feels like to bond so closely with a creature. When the developers have also put that aspect of the game in focus, something magical happens. Falcon Age is the story of a girl captured by an evil corporation’s robots and forced to do manual labor mining ore. While imprisoned, she cares for a baby falcon, and pretty soon, with it’s help, manages to escape the clutches of the corporation’s robot jailers. We quickly learn that she is the latest in a long line of falconers, hunters native to the planet that bonded with the creatures and used them for hunting and various tasks. As the latest to train a falcon, you’re tasked with taking down a few refineries to set the corporation’s operations back a little bit and help the resistance on the planet succeed. Before I get too much further, I need to mention the multiple ways that Falcon Age can be played, which has a pretty significant impact on the experience. Designed first and foremost as a PSVR game for use with the Move motion controllers, you can also play with a standard DualShock 4 and on a TV if you prefer (or if you don’t have a VR headset available). Accessibility is important, but the VR version of the game is easily the superior experience if you have the ability to play in the headset. 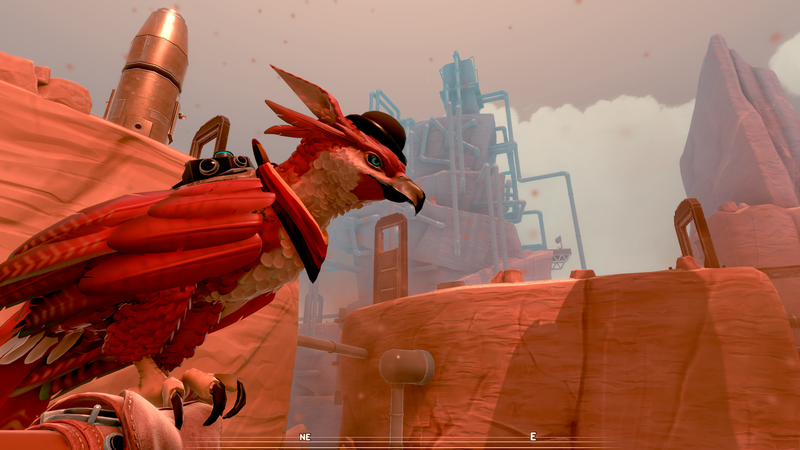 The headlining feature of Falcon Age is obviously the bird on your arm, a falcon that grows all too quickly from a baby bird to a full grown, lethal (to robots and small mammals, at least) bird of prey. Games that allow me to bond closely with animals hold a special place in my heart. Moss and The Last Guardian immediately come to mind, and Falcon Age manages to capture that same sense of closeness with a digital creature. I found myself talking to my bird the same way I do my cats and dog. I praised her when she did well, worried about her when she was hurt, and frequently would pet her feathers for longer than the in-game healing mechanic required. Using the Move controllers to interact with this magnificent creature deepens the immersion, from actions like lifting your fingers to your mouth to whistle for her, to holding your arm out so that she can land on it. While you can play with a DualShock 4 controller, it just doesn’t have the same effect. The Move controllers have a natural feel to them that can’t be replicated on a standard controller. The falcon isn’t just a pretty face though. 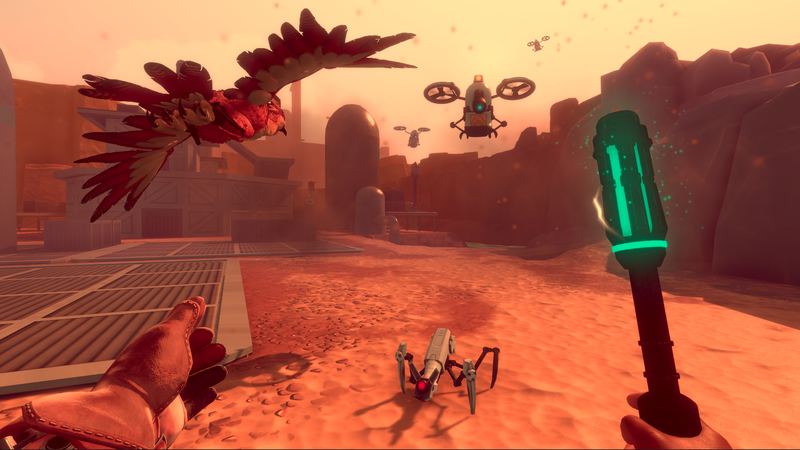 The game’s mechanics revolve around using the bird to forage for items and battle the evil robots the enforce the will of the corporation that’s taken over the planet. There are a lot of small nuances with how you can interact with the bird that help the whole experience to feel less like a game and more natural overall. To collect that item she just got, you can either whistle for her and have her land on your hand, or hold up your hand and let her drop it down to you. She can fly nearby you, or rest on your arm while you traverse the landscape. There are also a bunch of fun little outfits to dress her up in and toys for her to play with (including a miniature Transistor sword with some clever dialog). As a pet owner, putting these interactions under the microscope shows an accurate experience, one where I felt close to this creature on my arm. I giggled as I put sill hats on her. I smiled when I handed her a tiny skateboard. And I missed her whenever she left my sight. Where so much attention was focused on the falcon, and the mechanics and interactions surrounding her, the rest of the game just feels comparatively bland. Graphically, the environment is a bunch of orange stone with the occasional metal construct (courtesy of that mean old corporation that’s been poisoning the planet). There are a bunch of things added to try to deepen the experience, but they all feel extremely ancillary and unnecessary. Crafting or cooking allows you to make treats that temporarily enhance the stats of your bird, but I literally only ever used this once in order to be stealthy enough to catch a lizard, and even that was just so I could cook a treat for a trophy. The game will also have you running back and forth across the semi-open-world map, but this gets quite dull and repetitive with that boring and predictable orange environment. I wished that there was a fast travel option, but I feel like implementing that would unmask just how little there really is to do outside of playing with your falcon. It became especially tedious crossing over minefields that can take five minutes just to disable all of the mines, only to find that they are back again the next time you visit. There are side quests, mini games, and other little things to engage with, but for some reason they all feel so separate from that journey of just feeling like it’s you and your bird against the world. The rest of Falcon Age just seems a lot more gamified in comparison. Small bugs also litter the world. None were entirely game breaking experiences, but objects and textures would pop in quite frequently. A tutorial notification about putting my electric baton into a receptacle wouldn’t go away. A door I was supposed to go through (ironically the one just prior to completing the story) wouldn’t open even though it was supposed to. 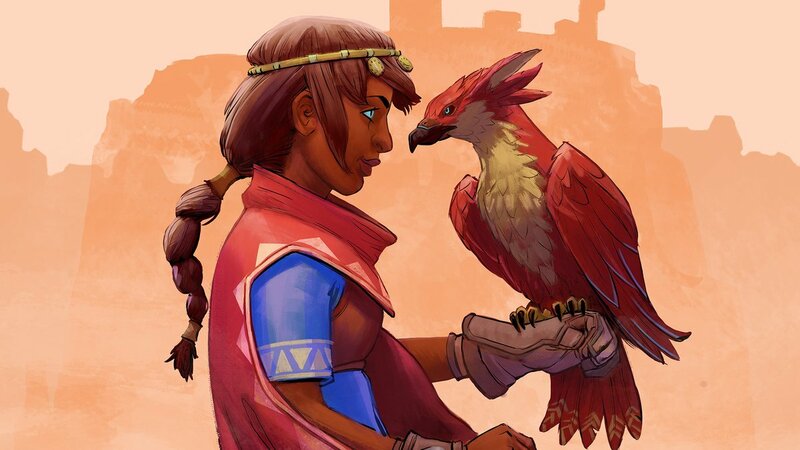 Falcon Age gets its animal interactions right. Bonding with the falcon is an incredible experience, but the rest of the game just feels like going through the motions. Falcon Age suffers from following too much of a “video game” formula where it doesn’t need to, which makes those elements noticeably stick out as sour points in something that is otherwise remarkable. There’s still a magic here, but it’s weighed down by unnecessary baggage that feels disconnected and separate from the central conceit of the game. Falcon Age review code provided by the developer. Version 1.01 reviewed on a standard PS4 with PSVR. For more information on scoring, please read our Review Policy.